Collision Advice CEO Mike Anderson offered additional perspective on two reimbursable supplies in his latest “Who Pays for What?” study, and the commentary might be of interest to repairers, insurers and vehicle owners examining charges for the items. Anderson’s company and survey co-author CRASH Network reported that insurers 35 percent of the time “always” or “most of the time” reimbursed boron drill bits invoiced by a shop. However, the majority of the hundreds of shops surveyed in October 2018 had never sought payment for the supplies. The 1.6 percentage-point increase in receptiveness from eight of the nation’s largest insurers was within the 3.5-point study margin of error, however. 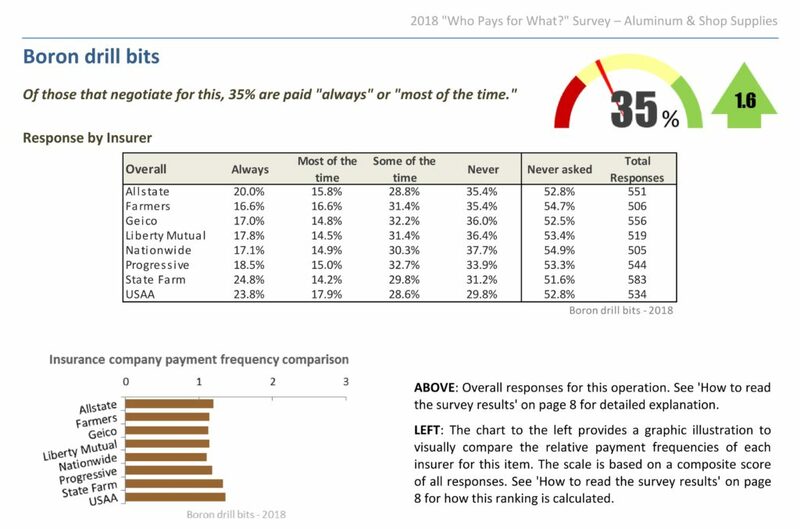 As often happens in these surveys, State Farm and USAA were more likely to consistently pay when a shop billed for boron drill bits. However, they were remarkably less likely to pay non-DRP shops. The “Who Pays?” report illustrated the subject with a 2009 Database Enhancement Gateway inquiry about a 2003 Ford Focus SE wagon’s bumper beam. The DEG user had asked Mitchell to include an “allowance for spot weld cutter bit” when removing and replacing the part. The DEG in response to a 2018 inquiry (also highlighted by the study) wrote that Mitchell’s materials policy extended to its two competitors as well. Speaking of mixing tips, the 2018 “Who Pays?” study found carriers were way more likely to consistently approve reimbursement of such nozzles than in 2017. The number of shops reporting being paid “always” or “most of the time” whenever they asked eight of the nation’s largest insurers jumped 23.6 points to 63 percent, far outside of the margin of error. More than 60 percent of the few hundred responding shops had sought to be reimbursed for mixing nozzles. State Farm, Allstate and USAA were the most receptive for shops overall, though another chart suggests that State Farm was notably less consistent with non-DRP shops as it was with its Select Service facilities. 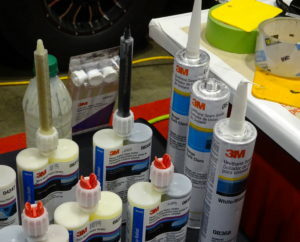 Help the industry by taking the current “Who Pays for What?” survey on “not-included refinish operations through Jan. 31. All answers are kept confidential — data is published only in the aggregate — and participants receive a copy of the report. 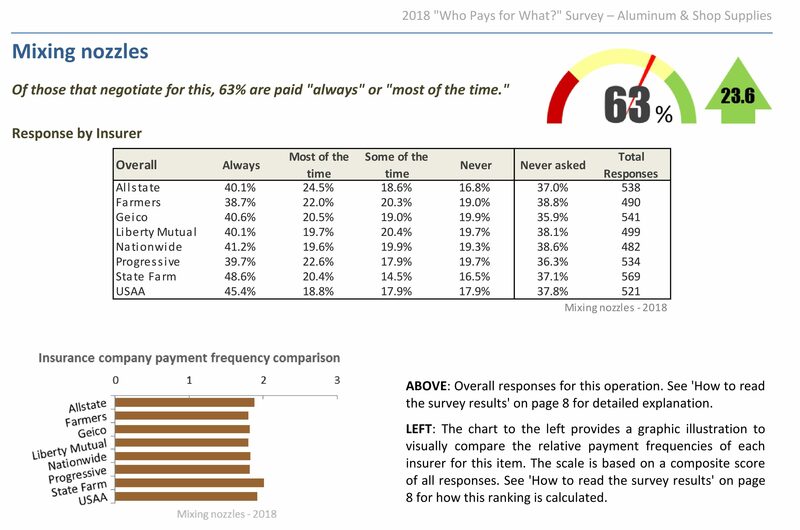 “I genuinely believe the information we are supplying through our ‘Who Pays for What?’ survey series is truly helping the industry, in large part by showing you, despite what you may be told, that you are not ‘the only one’ doing and charging for the nearly 100 ‘not-included’ procedures and estimate line-items we cover throughout the year,” Anderson wrote in the introduction to the survey.